India is the world’s largest democracy and media forms an important pillar of the democracy. Media is acclaimed as the fourth estate after judiciary, parliament and bureaucracy. Indian media in the past has been recognized as being sensitive, patriotic, and an influential tool in the socio-political sphere since the days of freedom movement. But unfortunately, a cancer in the form of paid news has been growing rapidly in the recent years. The phenomenon of ‘paid news’ in Indian media is becoming a threat to Indian democracy. The menace of ‘paid news’ is destroying journalism standards and respect for media companies and the profession. 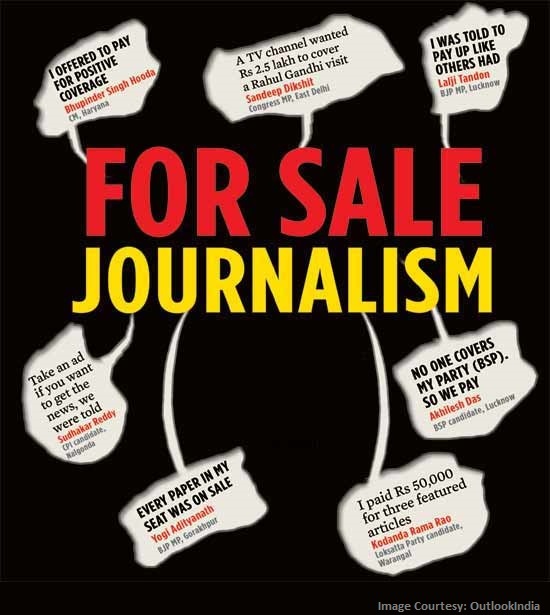 Today, it goes beyond the corruption of journalists and media owners, the practice of accepting money from corporate entities, governments, organizations or individuals to run favourable news about politicians, companies and celebrities has become very common in the Indian media, due to which the media is losing its ethical value. It is not working in the interest of “for the people, of the people and by the people”. The media has been receiving private treaties involving share transfers between media companies and non-media companies in lieu of advertisement space and favourable coverage disguised as ‘news’. This is commonly referred as the ‘paid news syndrome’. Today, India has over 82,237 registered newspapers and over 700 television channels, no other nation has as many newspapers and news channels as our nation has and the number has increased drastically during the last ten years. The numbers are increasing day by day, but they are lacking the quality. 90% of media coverage is related to entertainment and politics and only 10% to educate and enlighten people. Standard of media in our country is falling, paid news terribly deviates the media from its aims and objectives. It is compromising on the elements of honest journalism. The politicians and the people, who give paid news, are playing with the faithfulness of the people on media; it sabotages democracy and creates integrity risk to the nation. The impact of this malpractice undermines democracy. Now, ‘paid news’ syndrome has crept into the entire mainstream of Indian media. Media, that need to be an eye opener and mirror to the society are being deviated which is an unfair practice in a democratic country like India. Andhra Pradesh is always on the top line in the paid news scenario. The size of the market for paid news is very big; it is somewhere between Rs 300 cr to Rs 1,000 cr. Politicians who stood for elections during the 2009 Lok Sabha elections in Andhra Pradesh paid for favourable news coverage about themselves. It is really unfortunate that journalists forget their dignity for petty gains. The Election Commission disqualified UP MLA Umlesh Yadav for filling an incorrect statement of election expenditure and for paying two local Hindi newspapers for sponsoring ‘paid news’ before polling. She was the first political victim of the paid news phenomenon. The controversial telephonic tapes between corporate lobbyist Nira Radia and NDTV journalist Barkha Dutt created a storm, for fixing stories and running scripted interviews with politicians and for undermining the constitution by their alleged lobbying for A Raja as the Telecom Minister when Union Cabinet was being formed in 2009. Barhka Dutt who was a renowned and respected star reporter of NDTV has ruined not only her personal reputation but also severely dented the image of journalists. The former Maharashtra Chief Minister Ashok Chavan was involved in the paid news controversy. While contesting for Bhokar Assembly constituency in Nanded district, he had paid money to various Hindi and Marathi newspapers to get publicity and news praising him. He spent huge amount of money on advertisements, which was not accounted properly in his election expenditure account. Paid news is lowering ethical standards of journalism. Corruption in Indian media will eventually devour Indian journalism. Many believe that paid news has taken deep roots. Today, more and more people are losing respect for the media. They are subscribing to multiple newspapers and switch of TV channels because they do not trust media. This entry was posted on Jul 2013 at 6:38 PM	and is filed under Opinions. You can follow any responses to this entry through the RSS 2.0 feed. Your Feedback Matters! Most media is biased towards left in India. They either do paid news, do masti news or they project socialistic viewpoint. See how hollow it felt to see Kailash Satyarthi get Nobel prize. Nobody covered him, somebody in Norway knows more about what good is happening in India. Very disappointed, a new set of journalists are the need of the hour! !